A letter by Yann Lohr; first posted at Facebook on March 10 2015. The 8th of March, I lived a sad milonga. It was the 2015 International Women’s Day… and yet I still saw dance partners sitting all night long… as if nothing could ever change in tango. We “agreed” to only one “Tanda Rosa” (women invite men) during the entire milonga. During the Tanda Rosa, the dance floor was packed and a smile was one every face, then it stopped… and women went back…to their seats. But Why? Us men couldn’t have borne another Tanda Rosa? Couldn’t we have agreed to an entire “Tanda Rosa” Milonga, or at least half of one (fifty/ fifty) … once a year? 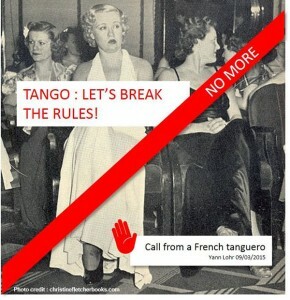 Is Tango still a place where some of women’s rights are denied? Today I am upset and I feel my heart sinking. The 8th of March, I was convinced, confident, positive when I left home to go dancing that each of the World’s Milongas would mark the occasion, celebrate the RIGHTS of women, i.e. to invite who they want to dance with. How long will we keep stripping that human right from our partners, wives, sisters, friends? As men, we know that if we pay for admission, we WILL dance, no matter the size of the ballroom or the number of the dancers. How is it that most of the time, it’s not so for women… they will pay, but won’t dance UNLESS they are invited. Well, as a man, my decision is taken: I will no more be complicit in this denial of women’s rights rooted in a well-established tradition in milongas (at least in my country). Ladies, no doubt you take time to make yourself pretty, perfume and make up…. but… is it to hopelessly be left on the sidelines all milongas-long? …smiling at dancer who will not invite you? …waiting for those already taken? Think of coming to the milonga with the confidence that you WILL dance, because you have the social right to invite the partners you like or want to discover? How nice would it be to just dance each tanda enjoying a total peace of mind because you know that you will dance the next tanda, and so on, until dawn peaks, unless YOU decide you stop dancing. Do you agree that something needs to change to do that? That a rule has to be broken ? A rule WE are setting or to which WE consent to obey? Does it make sense to you that if we don’t do it today, it won’t going to be better next year? Isn’t life short enough as it is to take your RIGHT to dance in your hands now, and not in 10 years, not 1 year, but RIGHT NOW! Do you agree it’s time to stop “trying to” give women their RIGHTS, but to give them room to take them? We have a growing number of quality societies, associations, groups and exceptional milonga organizers (I’ve been many place, it’s experience speaking). Each group can come up with ideas, test what works for them, start its policy, take actions. I’m convinced that it’s us, tangueras and tangueros, who will help our groups to set up this change. Wouldn’t you want that our groups lead the way? No doubts you have many ideas, some of which are probably already instilled by some groups you’re members. What matters is that they don’t stay just “good ideas,” but that each week they become tangible, durable actions. Any other suggestions is welcome ! We change things when we take actions. 3. and Gentlemen … if you accept (or like) to be invited by tangueras, BE PROUD OF IT AND MAKE IT KNOWN. We all make change happen because we take specific actions.